SAP S/4 HANA has become a well-known product that is being adopted by many companies taking the next steps towards the future, into the digital transformation. In this series we want to get into more depth with SAP S/4HANA related topics, like integration, Fiori and loads more. Therefore we will interview product experts to get a better insight and the information right from the source. In the first interview of this series Martin Herrmann is joining us. 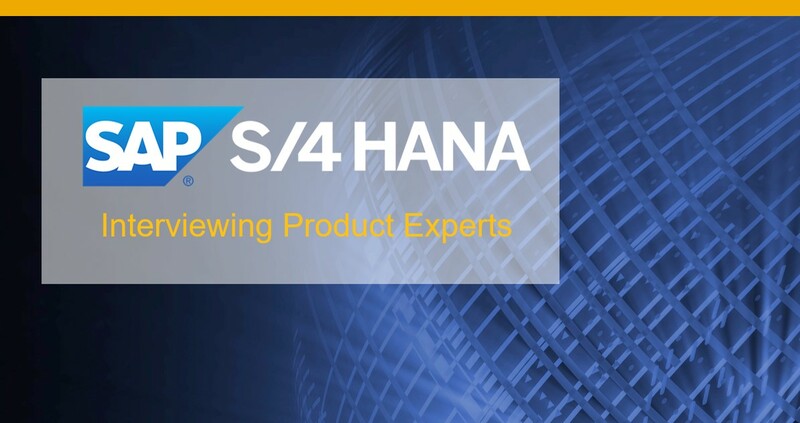 He drives extensibility within the SAP S/4HANA Product Management team and will give us an insight into the need to know information for extensibility with SAP S/4HANA. Bert: Thank you Martin for taking the time to join us today. Martin: Thank you for having me. Great to talk about extensibility with SAP S/4HANA today. Bert: Absolutely, so let’s get started right away. Extensibility is a topic that accompanies us for a long time already, why is it important to talk about it now? Martin: You are absolutely right, extensibility is nothing new to us. The topic is becoming more and more important in a world that becomes more connected and in which we want to minimize complexity and drive innovation adoption. Today extensibility is a major cost driver that blocks innovation. So with the new extensibility concept we want to reduce TCO and fasten innovation cycles. This sets a great foundation for the move to the Cloud. Bert: That is a good point and definitely helps our customers reimagining their business. Now let us go a bit more into it. Which types of extensibility are there in the SAP S/4HANA Cloud? Martin: Considering SAP S/4HANA Cloud we have to ensure that all changes are non-disruptive. This results in less TCO. However the customer needs to ensure a certain flexibility regarding end user usability. But also key users or even developer activities might need to extend existing, add additional functionality or use interfaces to other non-SAP systems. 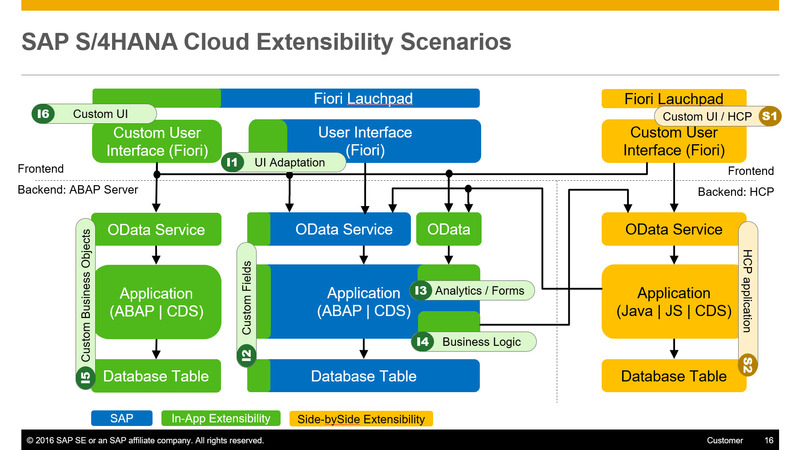 So with SAP S/4HANA Cloud we are talking about in-app-extensibility and side by side extensibility. All extension are loosely coupled. Due to this our customers don’t need to run post-processing activities after an upgrade. Bert: What are the capabilities of the extensibility framework? The in app extensibility options are activities made in the S/4HANA system. For example custom UI adaptions like change order of fields are possible on Fiori and supports the individual requirements of each end user. Changing of field names or adding additional custom fields are relevant for the team / company and the processes and are in responsibility of a key-user. Side by side extensibility considers external applications. The HCP activities are development related and of course also related to the company business requirements. Bert: Thanks for this overview, but let us be more specific. Can you give us more insight into the in-app extensibility? Martin: For the in app extensibility activities in the S/4HANA Cloud the extensibility tools are available in Fiori. It is designed to enable changes and enhancements directly on the Fiori screens. As a key-user you have the role to use the extensibility tools for adapting UIs, adding new fields, using the fields in business scenarios, extending business logic with help of BADIs or for defining your own queries and forms. Bert: How would that look on the customer side and what would a user have to do? Do you have a concrete example for in-app extensibility? Martin: So let’s consider the following example from a customer. You as a service provider invoice your effort based on employee and activity. The time recording of each employee is assigned to a ticket number which is created when the customer asked for support. In this case you need an additional field, for the ticket number, when you maintain the time recording. (I2 in the slide above). You as a key-user implement the extensibility in your quality system. You have the access to the apps to implement in app extensibilities. At first you go to the Extensibility, the Custom Fields and Logic. Here you add a new field which is in our example called “external ticket number” and is a character 10 field. This new field “external ticket number” got a technical name and is added automatically to a CDS view. The related oData service is also enhanced. So you are able to make this new field visible and editable on the screen (I1 in the slide above). Now your employee can assign the effort to the related ticket number. In a next step let’s assume you need this field also for the follow-up activities and finally it should be displayed in the itemization. This means you need to see this information when you release the billing proposal and finally you need to see it in the invoice document as well. Technically this is a “handover” of the field from the time recording to the release billing proposal, and to the invoice. This we call an extensibility business scenario. With help of predefined extensibility business scenarios you only have to activate the right one when you define the field for example in the time recording. The extensibility tool will automatically extend all related CDS views. But as mentioned, you also want to see it in the invoice. For this you need to activate this field also for the forms (I2 in the slide above). When this is done your XML will get the information. Bert: Martin, my last question for you would be. How can someone see which level of extensibility is enabled for each business object? Martin: When you define your own field extension you will be asked for which business object you want to do this extension. But we have to consider that we don’t offer all flexibility for all objects as of now. The extensibility tools have to be enabled for the objects. And this is not finalized, we improve it from release to release. For this we are in close contact with our customer. It is important for us to get feedback and to get their requirements. For example, the described scenario is a part of a customer requirement and is scheduled to work in the described way with the SAP S/4HANA Cloud 1702 release. Especially considering extensibility business scenarios we appreciate customer input. Bert: So this would be a great way for customers to engage with us on this topic. Thanks for giving us this is glance of what we can do with extensibility in the SAP S/4HANA Cloud. So, in general the idea is to give customers the flexibility they need, to make their system a success? Martin: Yes, in my point of view this is a very good example to show how easy and powerful the key-user extensibility in S/4HANA Cloud is. Bert: This is really an awesome insight into extensibility with the S/4HANA Cloud and we can definitely see why it is still a topic we should talk about. Thanks again Martin for sharing your knowledge with us. This is the first of many topics we will cover in this series. With this we want to help you adopt the new paradigms. Thanks again to the experts for sharing their knowledge with us. And stay tuned for even more interesting topics, next up is integration. Is it possible that some pictures are missing in the big text block by Martin? I can’t really make out what “(I2 in the slide above)” is referring to!? Thanks for sharing info on S/4HANA Extensibility. Is there any sap help guide avilalable on the app extensibility? Thanks for the overview and discussion! Can you please add a legend to the picture for all the special callouts: (I1-I6) and (S1-S2)?